We headed out early this morning to catch our great nephew Jordan's swimming match in Birmingham. We were heading to COSTCO afterward, but this match was a big deal. Jordan's been training for this since swim season ended last year. He's been to swim camps and has practiced three days a week with his swim coach without fail. The local high school in Jasper wants him to attend there. 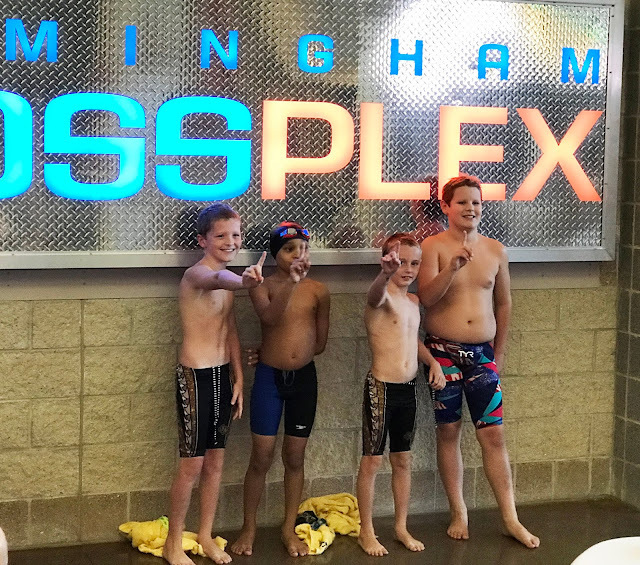 During the swim camp at my Birmingham Southern, my old alma mater, one of the people over scholarships at the school expressed interest in Jordan. She asked about his swimming, about his grades, and she talked to him about the facility at Birmingham Southern, He turned 10 in January. I couldn't spell college when I was 10. We arrived at Birmingham Sportsplex about 30 minutes early and sat by his nanna while he warmed up. The swim-a-torum was PACKED and it was toasty in there. They keep it warm for the kids, but when you get that many people THAT close together, you're glad you showered and put on deodorant before you left home. His first race and the only one we could stay for was a four boy freestyle relay. When the whistle blew, the first boy dove off the blocks and the race was on. Teams from all over the state were competing in the race. The noise level approached the level made by an F-111 at takeoff. The second boy launched off the blocks and he held his own. Jordan was the third and he hit the water like a dart. He made up time, but his team was still trailing when he tagged the wall launching the fourth boy. He was tied for second place when he hit the water but I think I saw smoke on the water behind this kid. He tagged the wall a full second before the other two finished. Jordan's team are state champs. I don't remember screaming, but I'm hoarse tonight. When I looked at Jilda and Jordan's mom Samantha, we all three had tears of joy on our faces. We are so proud of our young'un. I am so very, very happy for you all. Your pride was palpable. I'm sure all the boys on the team are proud of themselves. They should be. a difficult Spartan sport, but so rewarding when successful. Congrats Jordan! Also you guys are the best supporters the dude could have! Good to see all of your nephews hard work paid off. There are always lots of college sports scholarships available, but I didn't know they started scouting for them at such a young age. Wow, what a kid. He has that humble look about him and I think he'll go far. Congratulations Jordan. We are all proud of your achievements. Way to go, Jordan--I'm as proud of you as your uncle & aunt are!! Congrats to him and his team for winning. You should be proud even if you are hoarse but that’s for a good reason.